Being Retro: Star Wars: The Force Awakens, this is REALLY HAPPENING! Star Wars: The Force Awakens, this is REALLY HAPPENING! 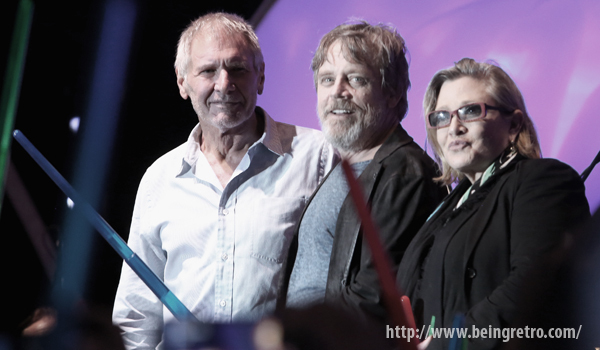 SAN DIEGO, CA - JULY 10: (L-R) Actors Harrison Ford, Mark Hamill, Carrie Fisher and more than 6000 fans enjoyed a surprise `Star Wars` Fan Concert performed by the San Diego Symphony, featuring the classic "Star Wars" music of composer John Williams, at the Embarcadero Marina Park South on July 10, 2015 in San Diego, California. (Photo by Jesse Grant/Getty Images for Disney). I know it's happening and it's right around the corner, but it lights up the child in me and sparks the old man that I have become. On the one hand it's got some faces that I know and of course love... followed by a new group the ones to replace. Replace is the key word, Star Wars always has to connect for me, I know these new people are connected. Are they really going to be able to hold my interest, are they for you? The child says "YES" and the old man says "NO" I am feeling left out of the excitement. I know it's coming, I am not just feeling the passion and I am afraid that is not going to change. Still on the fence, will the newest generation embrace the ideas... can JJ bring something new to the table and... and may the force be with us again? I'm keeping my excitement level low. Burned with the last three, although I know Abrams will do a much, MUCH better job. It's tough to imagine ever getting that feeling again that the first movie gave us. I have to say Star Wars is winning with Abrams calling the shots. The tribbles will have to get him back for defecting. Like Alex, I was stunned by Carrie's appearance (as if we could stay young forever.) Love that song -- though now I think of SUPERNATURAL whenever I hear it now. And, yes, I am truly excited after being burned by those prequels! !